Isn't this shoe fabulous? It sat in my Bits & Pieces basket for, oh, years. I almost gave it away because I didn't know what to do with it. Eons ago, I bought some Anna Griffin stamps via eBay. When I received my package, there were some bonus items thrown in with my order. It was an Iris-Fold kit by Anna Griffin (you can check out the technique HERE), and this shoe was part of it. This is actually the negative....you're supposed to fill in the die-cut frame with the iris fold papers. The shoe is made of a beautiful linen-look paper. I stamped it with Grace by Market Street Stamps (sniff, sniff...miss their background stamps!). I added holes, a bit of twine 'shoelace', and some pearls. 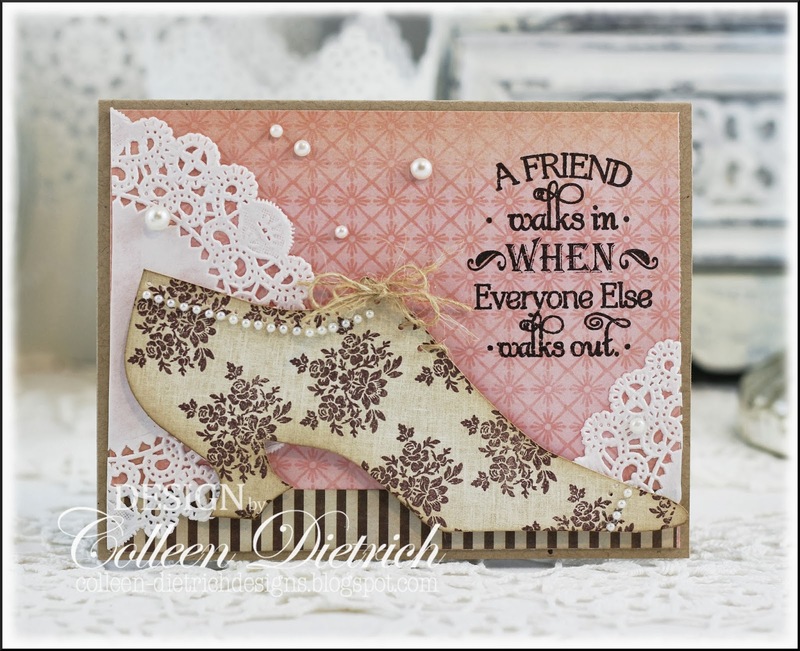 This sentiment from Inspired By Stamping couldn't be a more perfect match for the shoe. The Card Concept - Floral Theme - I've used a Shabby Chic & Vintage style on today's card. I'm honored that a few of my cards were chosen for shout-outs and honorable mentions recently: Fusion, CASology, Shopping Our Stash and The Shabby Tea Room. Very grateful! More good news to share: I started a new job a week ago! Alas, it's only temporary. I'm helping out at a tax firm - processing/assembling tax returns, answering phones, doing the mail, making appointments, etc. - 2-4 days a week. When April 15th rolls around, my job ends. It's great experience, good on my resume, and gets me used to working in an office environment again. And last, but not least, so proud of my 15 YO for her beautiful performances in the high school musical, 'Grease.' She's in the center, with the light blue dress. Haley had a blast, made a lot of new friends, and gave her self-esteem a much-needed boost. Oh, gushing momma here! Love love love your card! That show is amazing!!! And congrats to your daughter on her performance!!!! GREAT vintage look to this Colleen! Love the paper you used for the shoe, the pearls, the doilies...pretty!! Speaking of pretty, just look at your sweet girl!! Gorgeous design, Colleen!! You do shabby chic style so beautifully as always! I love how you pull all the elements together! Thanks for sharing your daughter's performance photo! Haley looks so grown up and amazing! You must be so proud of her! Way to go, Colleen (and Haley)!! gorgeous card, love the sentiment teamed up with the pretty papers and shoe die cut. yahooo for proud momma moments!!!! Stunning! Seriously stunning! What a fabulous way to showcase this amazing paper! 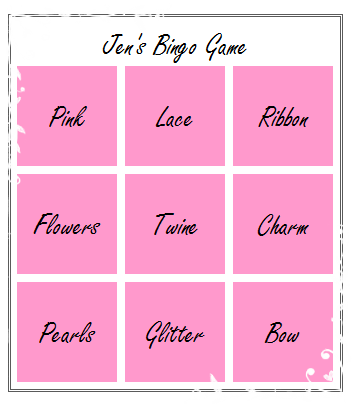 I love the pearls and the twine bow! Beautifully vintage and fabulously shabby chic! The sentiment is the PERFECT match (don't you just love when that happens!). Your daughter is beautiful! Center stage in a highschool musical takes courage! Her ear to ear radiant smile says it all! Ohhh...such a gorgeous card! Love how you added the little doily piece in the corner, laced up the shoe and stamped the shoe itself. I miss MSS too! Congrats on the recent shout-outs and the new job! And congrats to your daughter, looks like everyone's having a blast! Well, proud Mama, your daughter looks beautiful!!! And the card ain't so bad either! Gorgeous design, love that shoe. Pfew I can l;eave a comment again:). I really love your cards and looking at the previous ones and this beauty I can only sigh:). Colleen you have a unique and gorgeous style. And a perfect eye for the most lovely and elegant details! Great card! Glad you did not throw it away! I mentioned your bow technique on a blog entry today! So loving the Colleen Bow! 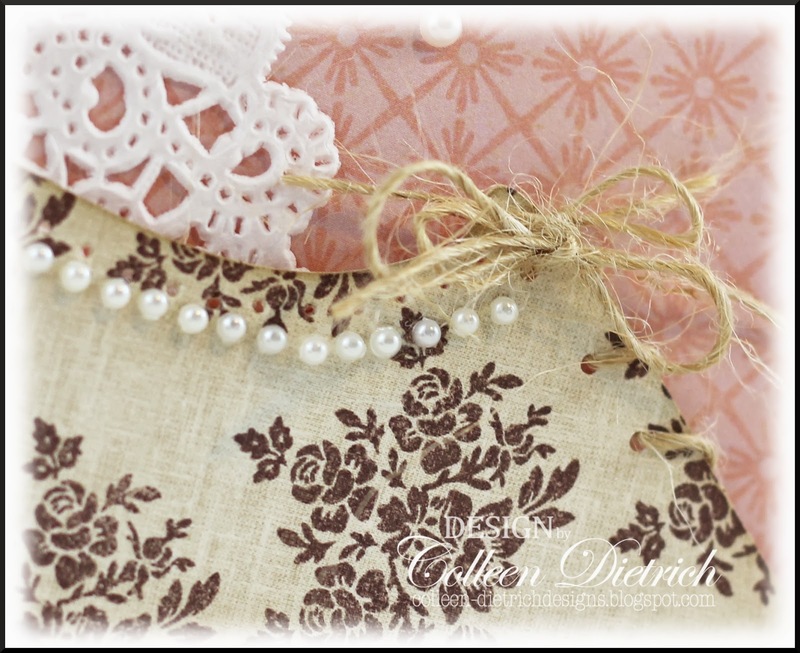 What a great vintage image...love the shabby chic feel to your card...that doily is perfect cut in pieces and that little string of pearls is so creative! Love this one...the sentiment is also very beautiful. Lovely card and congrats on all your shout-outs and mentions. The star of this show, of course, is that pretty daughter of yours. I know you're a proud mom..as you should be. Beautiful and elegant card Colleen! What a perfect sentiment to match it! Love the addition of twine and pearls too! Haley looks beautiful! Glad she had a good time. This is so gorgeous! Wonderful card and a wonderful sentiment, too! Thanks so much for joining us over at the Simon Says Stamp Wednesday Challenge! So cute!! Love the shoe!!! I know you are a proud proud mamma! Gorgeous! Your card is stunning as always! So so pretty! Congratulations to your daughter, and wishing her good luck, and your card is just super!! thanks for sharing!! Wow to everything! The shoe was too pretty to give up, but not nearly so pretty as when you were through with it. Perfect! You have the ideal sentiment to go with it. Yay, Colleen! Congrats on your job! A temp position is a good way to ease back into the workforce. I would hate to give up all that stamping time and time for home life, but I've been at it for more years than I care to consider. I would so love to be able to stay home. Your daughter looks beautiful center stage in her performance. You have a right to be a proud momma! This lovely slipper would make Cinderella green with envy! What a wonderful card! And Haley looks so pretty! You have every right to be a proud Momma! So pretty and I love this fabulous shoe! You SHOULD be gushing, Colleen! She is Beautiful and looks so Happy! 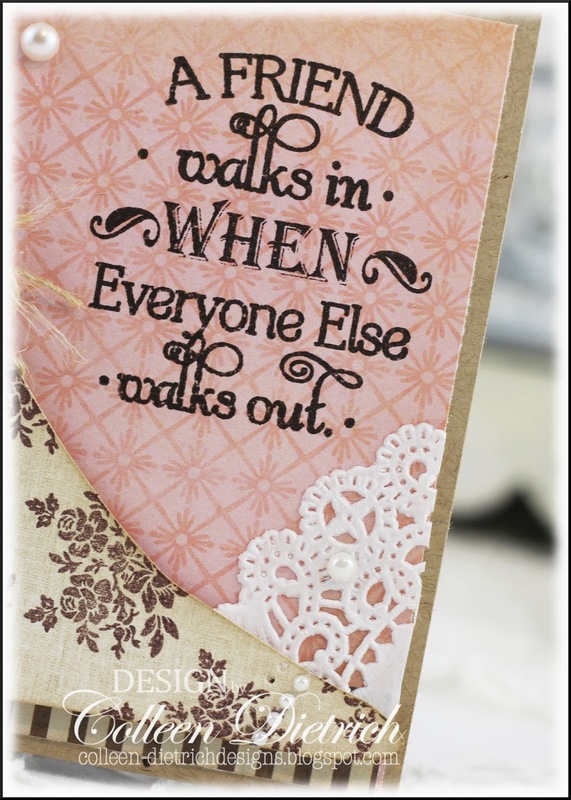 LOVE your card and the sentiment and the shoe! FAB! I remember you describing this clever, clever card to me when you made it, Colleen!! It is SO gorgeous!! You paired that shoe with the PERFECT sentiment. And the colors are super!! Amazing work, my friend. I also LOVED seeing your gorgeous photo of Haley in Grease!! Looks like she is having the time of her life. What an accomplishment! Way to go, Mom!! You are so right to be proud!! Just saw this card on Pinterest, pinned it and wanted to stop by and tell you how gorgeous this card is!!! Also your daughter is beautiful and she looks so happy in that picture :) Have a great day my dear!